E-Signature Capture for Proof of Delivery & Service Work. Speed order processing, minimize delivery disputes, elevate customer service and protect your bottom line. Today’s ubiquitous mobile devices like tablet PCs and smart phones are being leveraged to effectively and conveniently organize, coordinate, and monitor all aspects of delivery tracking and delivery management. The combination of these devices with Ponderosa’s E-signature capability is the solution for fast, accurate, cost effective, and up-to-the minute Proof of Delivery (POD) delivery monitoring. E-signatures provide real-time POD and helps to resolve disputes over deliveries and service work. POD documents are stored indefinitely in Ponderosa’s integrated Document Management System. Orders are automatically sent to your drivers’ devices for each truck and sorted by delivery stops. Customers simply sign the delivery receipt via the driver’s tablet or smart phone for immediate proof of materials delivered and the time of delivery. If no one is available to sign for the delivery, the driver can take photos and make job site notes, providing irrefutable documentation of what was delivered or installed, which is automatically attached to the customer’s order, with or without a signature, and can emailed to the customer on-demand. As soon as the delivery is complete, the order is removed from the driver’s phone and automatically archived by customer, by order number, in DataView via Wi-Fi or your data plan. Your proof of delivery can be easily retrieved at any time in the future. 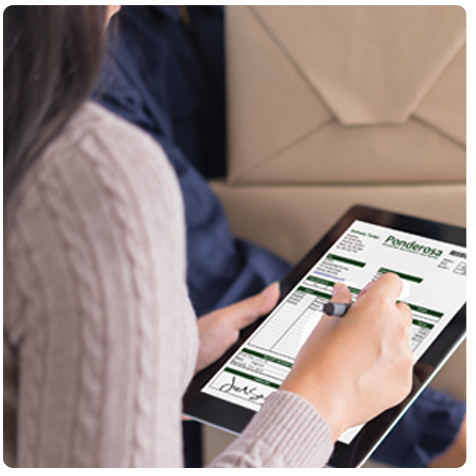 Ponderosa’s E-signature capability streamlines delivery dispatch operations and minimizes proof of delivery paperwork, data entry and duplication. There is no longer a need to enter or scan proof of delivery details at the end of the day when the drivers return with their delivery notes. Real-time instantaneous updates between your drivers’ devices and your Ponderosa system guarantee that your staff will have constant access to up-to-the-minute information that will unquestionably save them enormous amounts of time and prevent lost profits due to missing paperwork. Equally important you can improve your business customer service levels by keeping clients informed on the status of their deliveries and by issuing credit and debit memos the same day if needed. Ponderosa Software’s Point of Sale, Order Entry, Inventory, Production, Delivery, Installed Sales, Back Office, CRM, and Warehouse Management modules, coupled with powerful built-in Document Management, help you manage the business more profitably and run at optimal efficiency. Unique among LBM software providers, Ponderosa has developed an integrated set of capabilities, including the Sales Portal, designed specifically for millwork manufacturers and two-step distributors. For more information, call (800) 422-4782 or complete the information request below.